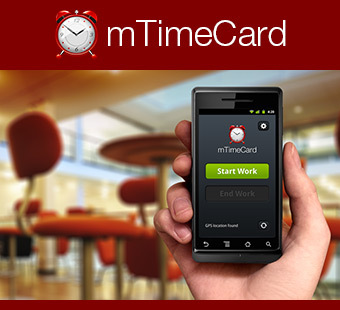 mTimeCard (mobile timecard) is a mobile service that lets SMBs easily monitor employee time and attendance. It is specifically designed to meet the needs of small and medium sized businesses, especially those involving mobile workers and workers paid on a flat rate basis. Minimized shift planning and supervisory overheads. How Can I Start Using mTimeCard? It is easy to use and sign up. The owner/manager sets up a work site, then adds the employees and allocates the job, scheduling the personnel roster. mTimeCard enables each employee to individually clock in and clock out from his/her mobile handset at any business location. You can enjoy a 7-day free trial period. You can also choose between three different pricing options, according to your specific business needs. mTimeCard integrates with PayPal to ensure secure financial transactions. Mobile TimeCard for small business, the easiest check-in and clock-in solution.